The Guitar Nebula is a guitar-shaped nebula in the constellation Cepheus. It is a faint nebula, about 6,500 light years away, but it is unusual because it is a bow shock nebula. This particular bow shock nebula is produced by a pulsar moving about 800 kilometers per second through the surrounding interstellar media. As the pulsar plows through the interstellar gas it disrupts it, much like a boat on a still pond produces waves. 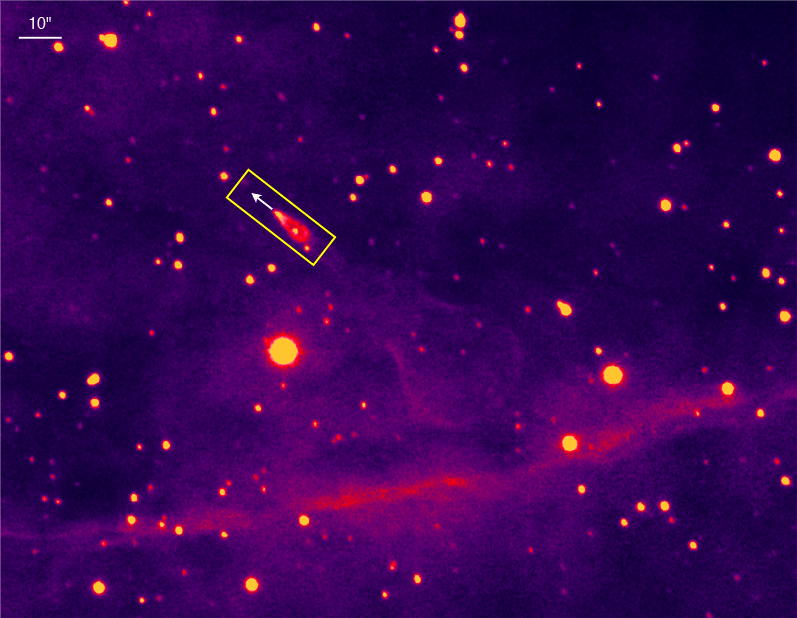 The nebula was first discovered in 1993, and it is among the strongest evidence a phenomenon known as a pulsar kick. Pulsars are neutron stars, formed when a large star explodes as a supernova. Because of this, one would expect a pulsar to lie within the surrounding supernova remnant, and to move at the same relative speed. But this is not the case with the Guitar Nebula. It seems that something must have caused the pulsar to move at great speed relative to the remnant. Given it a kick, as it were, hence the term pulsar kick (or neutron star kick). Given the mass of a neutron star (greater than that of our Sun) the only thing that could have provided such a kick would be the supernova itself. Just how the supernova can kick the neutron star isn’t clear, but there are a couple of ideas. One is that during the collapse of the progenitor star, the core becomes slightly off-center. This causes the surrounding star to compress asymmetrically, which means the resulting supernova exerts a large force on the core, causing it to race off at great speed. Another is that it is an electromagnetic effect. If the magnetic field of a pulsar is off-center, the jets of energy produced by the pulsar would also be off-center, and thus would push the neutron star like a rocket. There is a third, much more hypothetical possibility which involves the sterile neutrinos I mentioned yesterday. The basic idea is that there is an asymmetry between regular neutrinos and sterile neutrinos. Since intense nuclear interactions occur within a supernova, it is possible that both regular and sterile neutrinos could be produced. But because of the asymmetry between the two, this would result in a kick being given to the resulting pulsar. We still aren’t sure of the nature of sterile neutrinos (or even if they exist), but some theoretical papers show that it could solve the pulsar kick mystery. At the moment, the asymmetrical supernova model is the most popular. It will take more study to determine if that is indeed the solution.